Wait is over with Good news for die hard Admirers of Microsoft windows Phone.Windows 10 is officially available for old windows phone to get into next generation. Microsoft Officialy provides a list of phones that support Windows 10 Update. Microsoft supports a wide variety of Microsoft Lumia (formerly Nokia Lumia) phones. Right now, the only non-Lumia phones that will work are the HTC One (M8) for Windows and the LG Lancet. 2.originally shipped with Windows Phone 8.1 installed on them. Microsoft also now offers an “Upgrade Advisor” app for Windows phones. You can install this on your Windows phone to get a better idea of whether your phone will be eligible for the Windows 10 upgrade and what you’ll need to do. Unfortunately, even some phones that will be eligible for the full Windows 10 upgrade may not be allowed into the preview program. Get ready to install for new Microsoft invention Windows 10. Go to Windows Store > install Upgrade Advisor app. Click on Next to find out if the update is available for your phone. If it is, check on Enable Windows 10 Upgrade and follow the on screen instructions. Next, go to Settings > Phone Update > Check for Updates to download the update. Please note that once Windows 10 Mobile is installed on your device, you will have to check for updates again from Settings to get the latest build 10586.164. 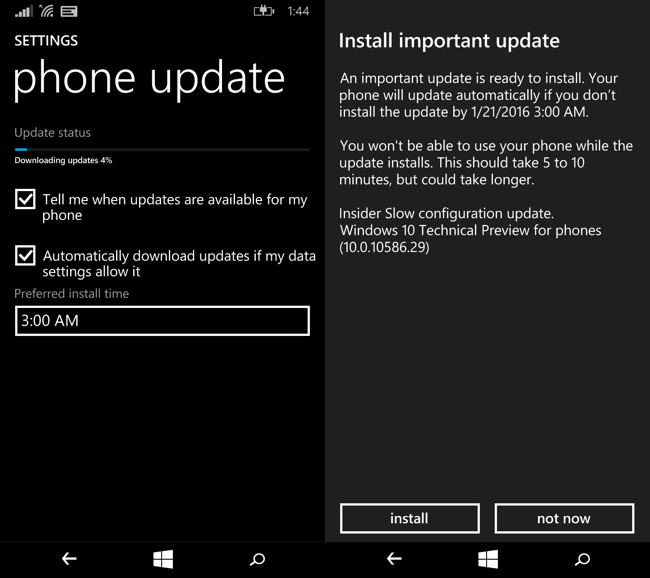 The first installation upgrades your device on build number 10586.107. Please be sure your battery in almost full to start the procedure. To get started, grab your Windows phone and open the Store by tapping the “Store” tile. 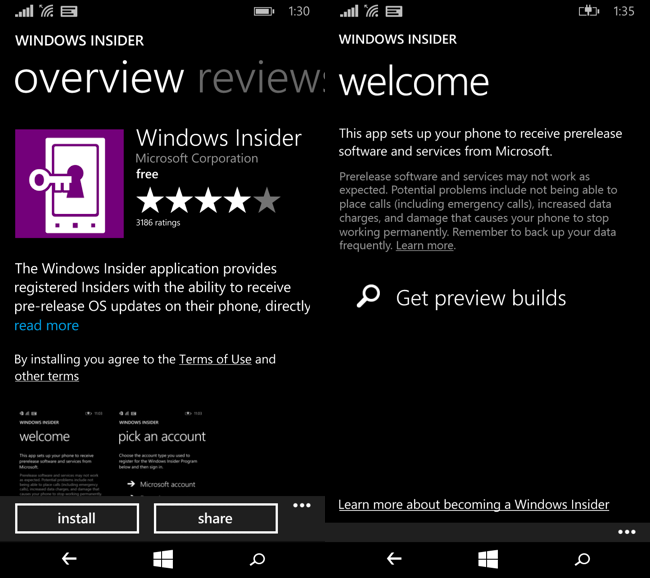 Search for “Windows Insider.” Tap the “Windows Insider” app by Microsoft Corporation and install it. Once it’s installed, open the app and tap “Get Preview Builds.” It’ll walk you through the process of downloading Windows 10 to your device and updating it. You’ll likely want to choose the “Insider Slow” builds, which will give you more stable builds of Windows 10. “Insider Fast” will give you more bleeding-edge builds with newer features, but they’ll generally be more unstable as they haven’t seen as much testing. After last step, Microsoft will attempt to scare you off one last time, emphasizing that this is still unstable code and it provides no guarantees it will work properly. 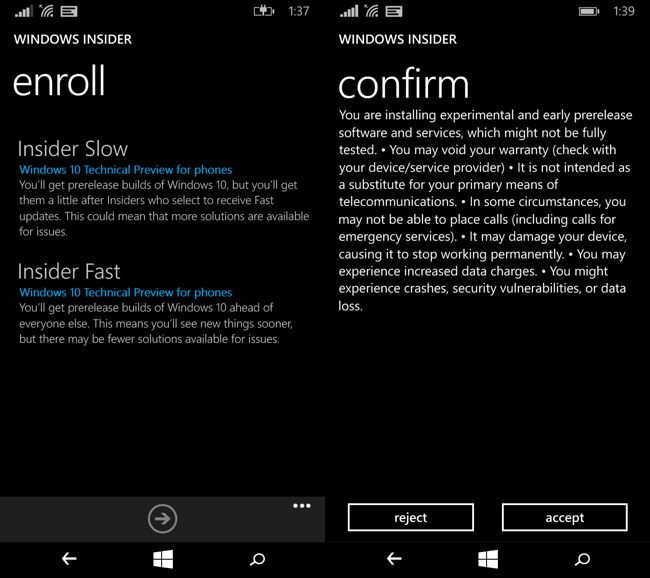 After you tap “Accept,” your phone will reboot and be on the insider preview channel for updates. Your phone will start installing updates on its own. If you open the “Settings” app and tap “Phone Update” under “Update + Backup,” you’ll see that the phone is downloading the update. When it’s done downloading, you’ll be asked if you want to install the update and told this process should take five to ten minutes. This process will actually take quite a bit longer than that, depending on how fast your phone is. You can leave your phone alone and it will finish the upgrade on its own. When it’s done, it will boot back up into Windows 10 Mobile. Its all done. Now restart your device to Feel new looks and features of Windows 10.